While visiting Thubten Shedrup Ling Monastery and Atisha Center in Australia, where they are building the Gyantse Stupa, Lama Zopa Rinpoche thought that it would be important especially for western people who had become Buddhist to remember the great kindness they had received from His Holiness the Dalai Lama, Padmasambhava, the Dharma Kings, Shantarakshita and the Tibetan people as a whole. 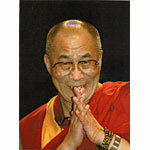 While thinking how important it is, in addition to providing whatever help to Tibet that they can give, for these westerners to direct their thoughts and wishes to the welfare of the Tibetan people, this prayer came to His mind. 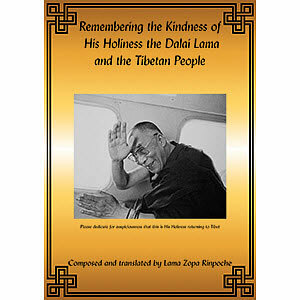 He composed it especially for the success of His Holiness the Dalai Lama’s wishes, and in particular for the Tibetan people, and for there to be perfect peace and happiness in the world and for all sentient beings to achieve enlightenment. 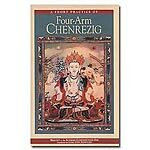 Composed and translated by Lama Zopa Rinpoche on 4 June 2011 in Eaglehawk, Victoria, Australia. Transcribed by Ven. Holly and edited by Jon Landaw. This prayer is to be recited after the Prayer that Spontaneously Fulfills all Wishes (Tong nyi nyinje) at the end of dedication prayers. This prayer is to be recited throughout the FPMT organization and beyond. 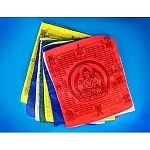 This booklet is intended for those that already have Essential Buddhist Prayers. 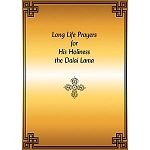 A booklet for those without the Essential Buddhist Prayer book including all the prayers for His Holiness and Tibet can be found here.